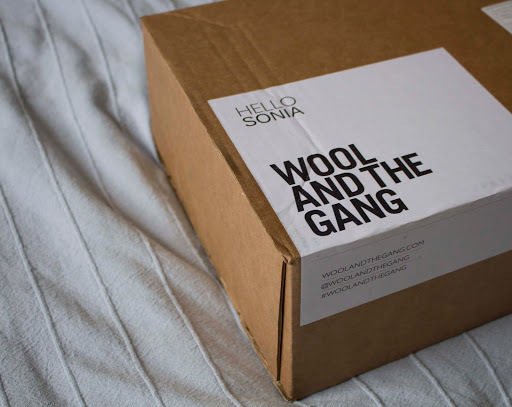 I was so excited when I received my order from Wool and The Gang. As soon as the box arrived I knew I was in for something special! So I wasn’t completely anti Black Friday this year as I expected to be. Instead I shopped carefully. Meaning, I chose a company I believed in and that I believe operates consciously. 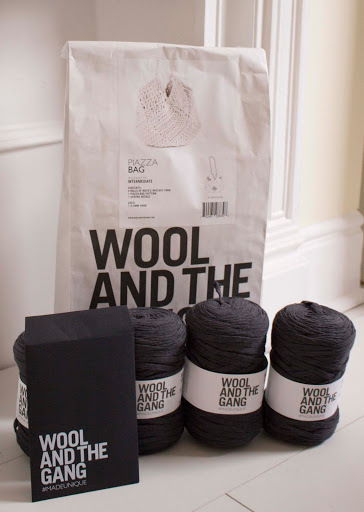 I first stumbled across Wool and the Gang’s kits in John Lewis over a month ago and fell in love with the idea of knitting my own jumper! The first kit that grabbed my attention was the ‘PIAZZA SHOULDER BAG’. I chose this bag in particular because it reminded me of the bags my granny used to go to markets with! 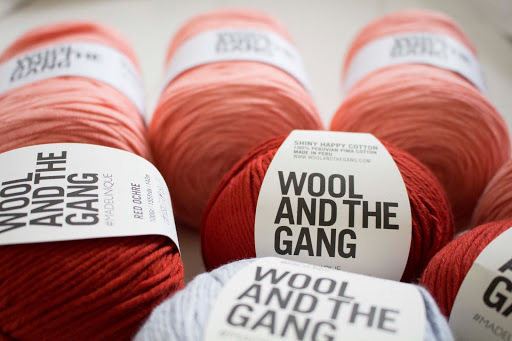 The kit includes mix taped yarn that is a blend of cotton and polyester (aka Vegan friendly!). From the outset it looks super strong too, everything you need to carry a bag full of bananas back home in! I have to say that the clean packaging is perfect! Zero plastic! I decided on ‘indigo ink’ as the colour of choice! Although I love bright colours in my design work I’m no longer brave enough to wear them too close to my skin! So I thought this dark grey hue would compliment the navy and black I tend to wear more often. You can also add a wooden crochet hook to your order if you don’t own one already or are buying this for somebody as a gift. Honestly, I’m a bit of a novice when it comes to crochet. I can do the basics but do struggle with following patterns! 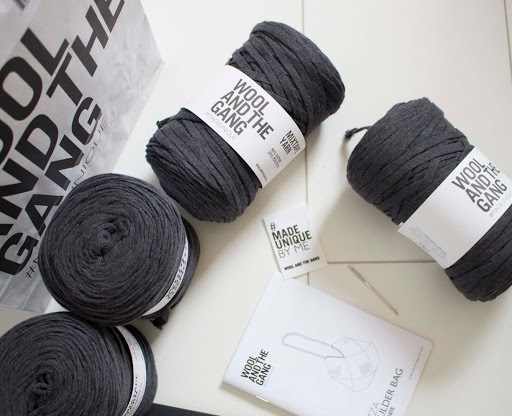 I’m excited to get stuck into tangliatelli of yarn! I even bought extra yarn to make a second bag as a gift! I splashed out on some Shiny Happy Cotton in Red Ochre and purple haze. I’m planning on knitting myself a winter beanie in the red! I was expecting the cotton to be very stiff but the texture is so soft! You can feel the extraordinary quality! And the sheen you get from it is formidable, I feel like I have just picked an apple! ‘ It’s silky soft hand-picked cotton from the north coast of Peru’. The product description does not lie! I plan to start knitting and crocheting over the Christmas holidays and I can’t wait to show you my progress or what might become a disaster! I will be in need some motivation! Please show me what you have knitted or crocheted by leaving a link in the comments below! Hey Sonia, I share you’re knit&crochet interest and I’d love to try out the Piazza Shoulder Bag. Really looks like my grandmother could had designed it but it’s perfect for summer! I would be happy if you’d like to exchange Pattern Booklets! I could offer you Etta Cardigan or Right Time Shirt in englisch, I got a whole bunch more unfortunately in German. Thanks so much for your comment! I picked the Piazza bag for the very same reason! I’m sure my grandma had something similar when I was growing up! Very nostalgic! Unfortunately, I’ve been a bit useless lately, I’ve not started on the bag yet! So I will have to keep hold of the pattern book until I do. Once completed I will definitely be interested in doing a pattern swap! I think that’s a great idea! Thank you again for sending your message, It’s given me the push I need to get crocheting again! I will be taking some photo’s and notes of my progress and will eventual share this on the blog and definitely via my Instagram! Thanks for that fast answer! If you like we can exchange like Screenshots via Email, just mail me, I will respond!